I’m so glad you’re here today because I have a lot to share. 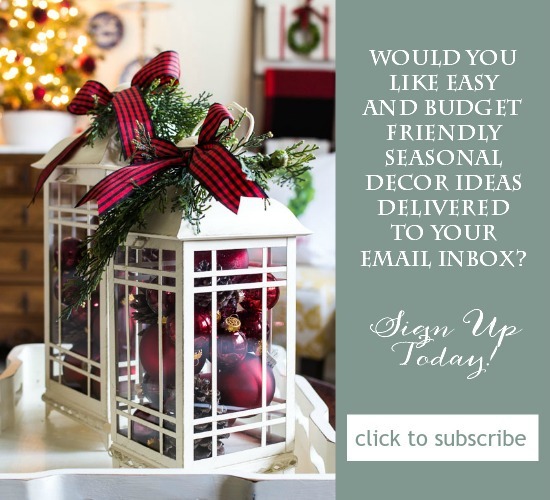 My Simple Christmas Entry Decor and links to incredible Christmas inspiration from my bHome friends. First up is my entry. Even though it’s a very small space, I have managed to add a touch of Christmas to each corner. Last year, as a present to myself, I bought two preserved boxwood garlands for my stairway. I cannot tell you how much I love this stuff. It is so pretty and the color is amazingly vibrant. If properly stored, it should last for years. I invested in another garland this year for my dining room. You’ll see that hopefully next week. A few months ago, while I was working on my eBay guides, I happened on a listing for a vintage red enamelware pitcher. It was love at first sight and I had to have it…after that, I was on the hunt for more. It took some patience but I was able to snag two more pieces. They are perfect for the three bottom stairs. (You can see HERE what I did last year.) One of the things I have learned about collecting vintage items is that it takes time if you are looking for a particular thing…especially if you are on a budget. When I am looking for something, I check eBay a couple of times a week and eventually I find it. I used a preserved boxwood ball in the middle pitcher to tie in with the stairway garland. Simple but festive. 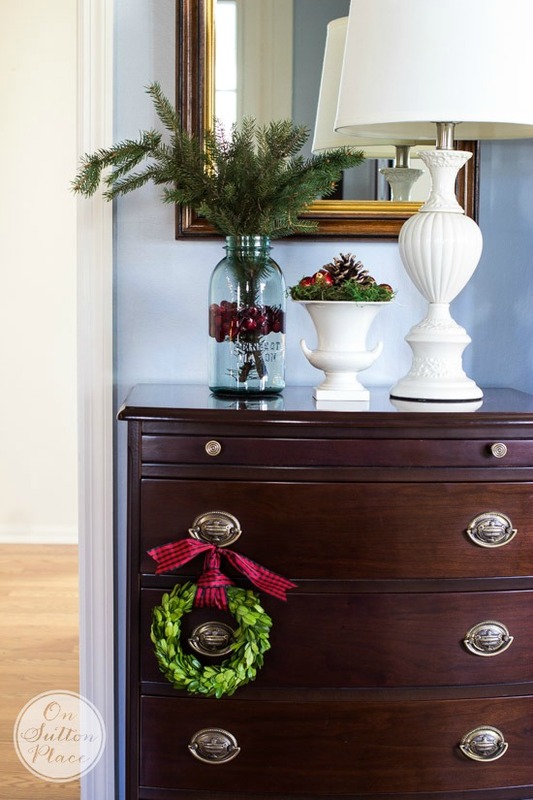 A tiny boxwood wreath on the entry dresser, fresh greens and cranberries in a mason jar, and an urn of pine cones were all that the little dresser needed to get in the holiday mood. I made the grainsack Christmas trees in the image below a few years ago and I still love them as much now as I did then. 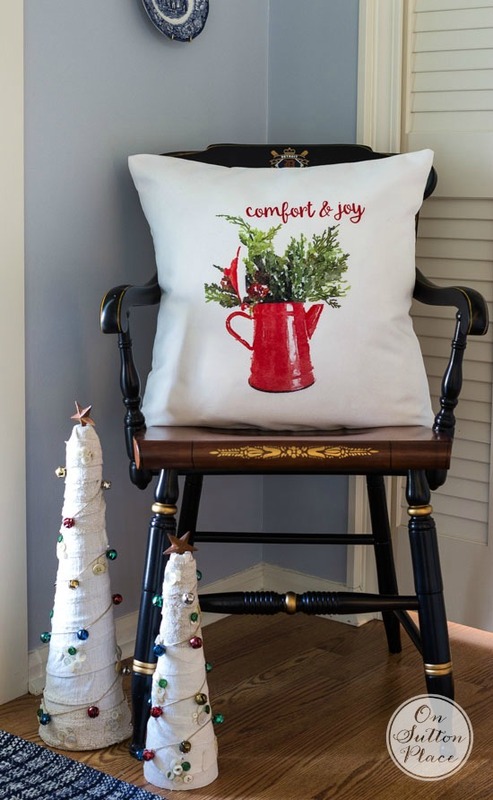 To finish this little corner of the entry, I added a Christmas pillow…which just happens to have a red enamelware pot on it! This last corner wraps up my simple Christmas entry decor. I honestly love these JOY printables. They are the first thing I see in the morning as I come down the stairs…and are a good reminder of what this Christmas season is all about. If you want to look at vintage enamelware on eBay, just click HERE. I love your style.Your holiday decoration are what I strive for. Simplistic and elegant. It has been wonderful finding your blog. I look forward to more ideas and inspiration from you. May you and your family have a wonderful Christmas. Lovely, simple, relatively inexpensive ideas that are easy to replicate – without having to be carbon copies of what we see in your home. Thank you for sharing and have a Happy Christmas. HI Ann I just found your blog and your house is beautiful! I was looking back at your christmas tour from 2013 where did u find that garland with the lights and red ornaments?? Id love to get something like that for my entry way, but I have not been successful in finding anything I loved. So warm and inviting Ann – love every gorgeous detail! Happy Holidays! I love your red emanel ware and your entry into your home is awesome. Love the idea of greenery in the vase with cranberrys. Your grain cloth trees look cute , you that’s a must pin. I love all of the vintage red – so beautiful. I am bummed though…I don’t own a cell phone at all so I can’t enter the giveaway. The posts about how you decorate your home are always my favorites! Your style is classic without being boring, with just a slight nod to trends. It’s not easy to create such a perfect balance. To each his own, but I am not a fan of most of the home blogs where the rooms are just bursting at the seams with trendy stuff. Happy Holidays, Ann, and thank you for your lovely blog! Your entry way is just lovely, and that boxwood garland is so pretty. I love red enamel ware, I don’t think I have ever seen vintage in that great condition and they are perfect for your decor. I love how you resisted any temptation to further embellish your boxwood garland. The twinkling lights are “just right”. 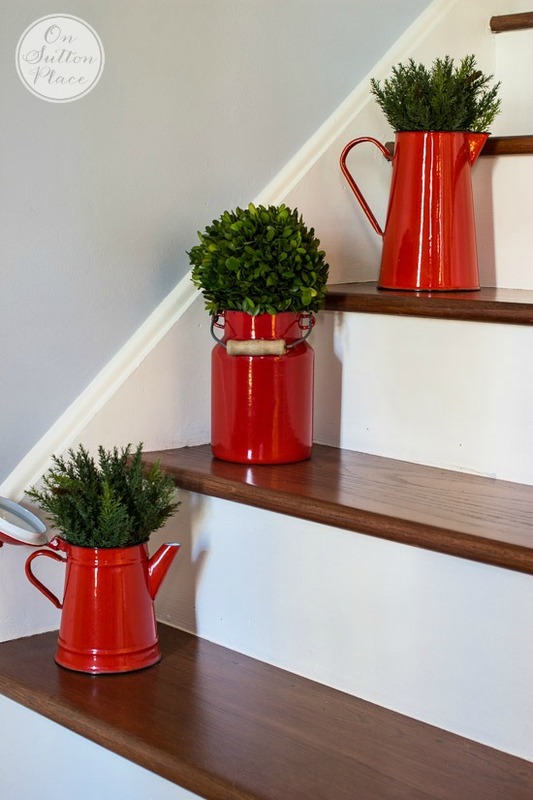 Genius use of the red enamelware for whimsy and a pop of color! Ann, your Christmas decor is simply beautiful! I enjoy your postings very much. I think you know when enough is enough. Very special JOY to you and your dear family. I just got hardwood floors installed this week (crazy, I know! Who does that? We’ve only waited about 6 years!) with new stairs being installed this weekend. I’m looking forward to adding touches of Christmas there. Thanks for the beautiful inspiration! The precision of the choice and placement is impressive. There is symmetry and balance and…perfection. Those pitchers are fantastic! Love it all, thanks for sharing. It’s so simple but so beautiful. And now I’m going to be on the lookout for some cute red enamelware pitchers (darn you!). All I need is another collection, lol! Thanks for the tour! Very nice decorating. Love the enamelware. Your decorating never disappoints, Ann! 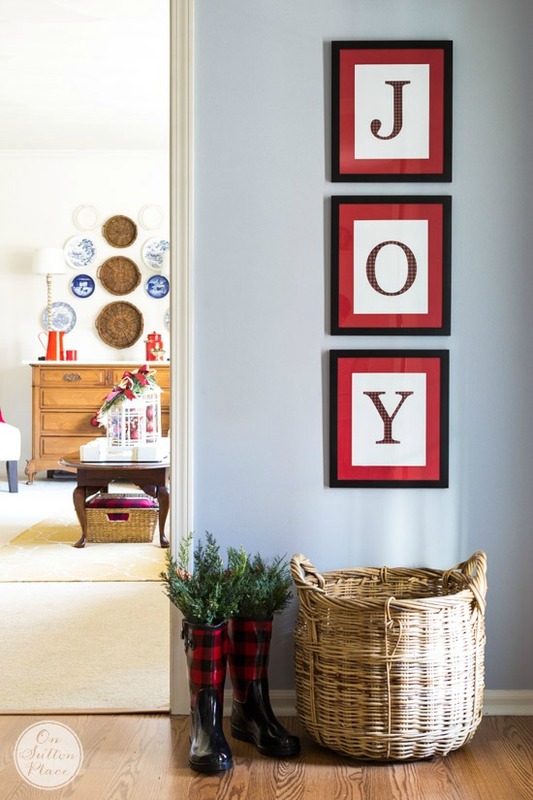 I love all of your festive touches, the boxwood garland is gorgeous and that red enamelware!!! Love it all! Thank you so much for putting this tour together. It has been beautiful and fun to browse! Such a great and talented group of bHome bloggers! I’m looking forward to sharing tomorrow! Love the entry with pops of red. The links you provide are so helpful. After being inspired its great to be able to browse and shop for items to help get the look. I was remembering your little grainsack stockings. Did you ever provide a template for them? Was wanting to make some this year for the placesettings and also be able to use them in various ways. Thanks for a great post. Ann thank you for all of your wonderful posts all year long! Always enjoy each and everyone. Ann, It’s lovely! I love the boxwood garland I don’t think I’ve seen that before and the red enamelware and those plaid boots SO cute! Thank you for all your work Ann, I really appreciate it!! I just love the fact that you use red in your decorating. I love the boxwood so much. I bought our grandson’s girlfriend an ornament that is the word “JOY” because she brings us so much joy; and that is indeed what the season is about!!! 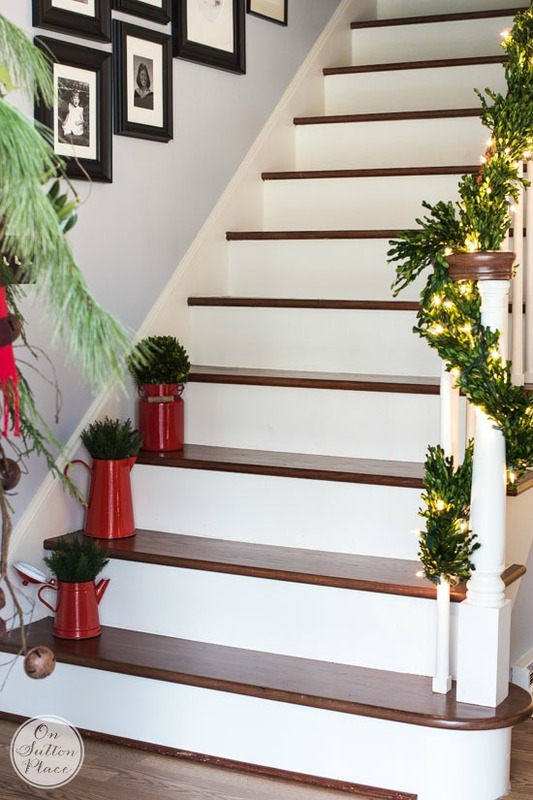 Ann, I am seriously into the less and simple decor this year and yours is just right with the special details you added like the cute red vessels on the stairs and the plaid boots. Love those. Ann, the foyer is just filled with beautiful details as a result of your most creative and wonderful talent. 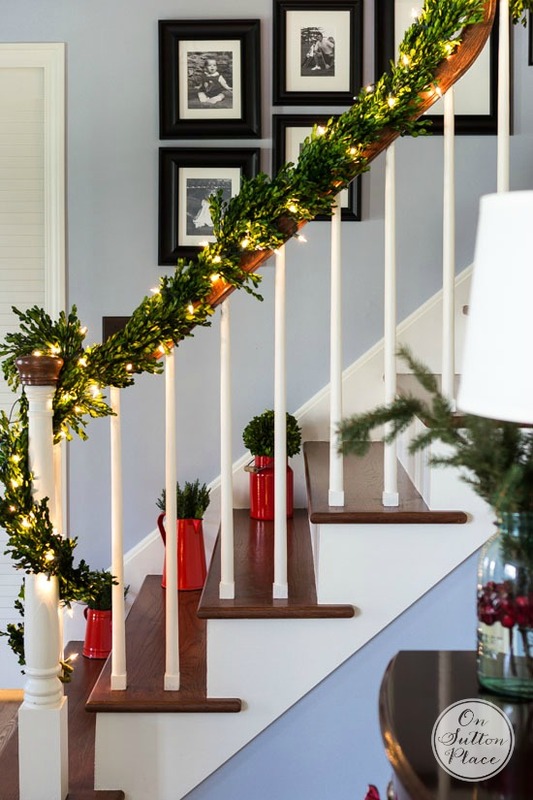 I love that preserved boxwood garland…I would have loved it as a present to myself too!….That red enamelware is the best and that pillow of course is perfect!….Now off to order that pillow to use in my kitchen next year..Beautiful foyer, beautiful home….Merry Christmas to you and your family Ann! Ann, again you’ve hit the nail on the simple little head! You are pulling the plug on the stress for the rest of us. Oh, my goodness. How perfect is that pillow? Don’t you just love it when things come together? I love your Christmas decorating. Classic, classy and beautiful. Your home is just lovely all of the time but especially for the holidays. Love how the simple touches have major impact…truly classy without being overdone! As always you inspire. Our homes are similar in age and style and I appreciate just how much you can do with such charming decorations. Thank you. Merry Christmas! I love, love, love, your entry way. Loving the pops of red. I had no idea you could get boxwood garlands. I have a wreath, but never thought of a garland. Love the enamelware too. Let me say I am swooning over your wellies. Guess I made my point, loving it all. Have a wonderful Christmas with your family. LOVE your red enamelware Ann. I was considering starting a collecting myself. But then I realized, I don’t even have one place to put anything anymore lol. Your home looks beautiful.